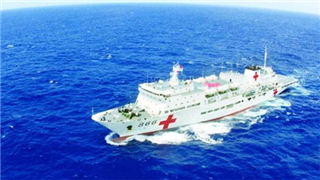 SUVA, Aug. 2 (Xinhua) -- The Chinese naval hospital ship Ark Peace, which is on Mission Harmony-2018, arrived on Thursday in the Fijian capital city of Suva, beginning an eight-day goodwill visit and providing humanitarian medical service in Fiji. At the grand welcome ceremony hosted by the Fijian side earlier Thursday, the Fijian military band played the melody of welcoming guests while parading and the local people presented garlands to the mission commanders. Rear Admiral Viliame Naupoto, commander of the Fijian armed forces met later Thursday with the commanders of the Mission Harmony-2018 and representatives of men and women in uniform of Ark Peace at Queen Elizabeth Barracks and hosted a traditional welcome ceremony to convey his warm welcome to the second visit by Ark Peace. Fiji is the third stop of Ark Peace's current mission and this is also the second time for the ship to visit the South Pacific Island nation after its first successful visit four years ago.